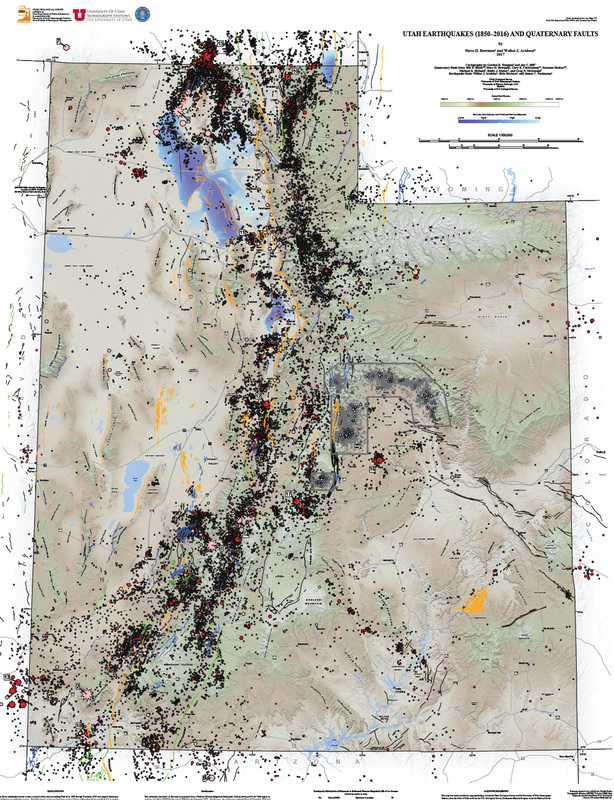 The Utah Geological Survey (UGS), University of Utah Seismograph Stations (UUSS), and Utah Division of Emergency Management (UDEM) recently published the Utah Earthquakes (1850–2016) and Quaternary Fault Map (UGS Map 277). The new map shows earthquakes within and surrounding Utah from 1850 to 2016, and faults considered to be sources of large earthquakes. There is a 57% probability (over 1 in 2 chance) that a magnitude 6.0 or greater earthquake will occur in the Wasatch Front region in the next 50 years. To address this threat, the Utah Earthquake Program, consisting of the UGS, UUSS, and the UDEM, developed the map so the public could more fully understand the hazard from earthquakes and faults, as well as the resulting risk to property, infrastructure, and life safety in Utah. Users of the map will be able to determine past earthquake locations and relative magnitudes (size), along with the locations of active faults and the timing of their most recent movement. Printed copies of the map are available for $15 at the Utah Department of Natural Resources Map & Bookstore. The map is also available as a PDF download at https://ugspub.nr.utah.gov/publications/maps/m-277.pdf (44 by 62 inches in size) and can be printed on a wide-format printer. Arabasz, W. J., Burlacu, R., and Pechmann, J. C., 2017, Earthquake database for Utah Geological Survey Map 277: Utah earthquakes (1850–2016) and Quaternary faults: Utah Geological Survey Open-File Report 667, 12 p. plus 4 electronic supplements, available as a PDF download. The electronic supplements include the data for the seismic events plotted on the map, which are listed in two separate catalogs, each in the form of a Microsoft Excel workbook and an ArcGIS feature class within a file geodatabase. The catalog files are available for download. On September 02, 2017, in eastern ​Idaho ​near ​the ​town of ​Soda Springs a magnitude 5.3 earthquake occurred that was widely felt throughout southeastern Idaho and northern Utah. This earthquake has been followed by a very active aftershock sequence. These earthquakes are slightly outside of the University of Utah Seismograph Stations area of responsibility, but the area is of interest to UUSS and the USGS Earthquake Hazards Program. UUSS in partnership with USGS have deployed two UUSS 3-channel strong-motion systems and six USGS 6-channel seismic systems (broadband and strong-motion) within 50 km of the seismicity. The following page includes information about the earthquake sequence and webicorders for the temporary stations. We will update the page with more information over time. October 04, 1967, 10.1km ( 6.3 mi) ESE of Sevier, UT. US Geological Survey website: earthquake.usgs.gov. The University of Utah Seismograph Stations reports that a minor earthquake of magnitude 3.3 occurred at 11:21 AM on September 18, 2017 (MDT). The shock was located 14 km (8 miles) beneath the Wasatch Mountains, 5 km (3 miles) south of the town of Summit Park, Utah, and 11 km ( 7 mi) WNW of Park City, UT. This earthquake was reported felt in Park City and Salt Lake City, Utah, other locations in the Salt Lake Valley, and in northern Utah County. Four other earthquakes of magnitude 3.0 or greater have occurred within 25 km (16 miles) of the epicenter of this event since 1962. The largest of these events was a magnitude 3.6 on June 30, 1999, 6.9km ( 4.3 mi) W of Park City, UT. The USGS has released an information page for the Sulphur Peak earthquake sequence near Soda Springs, ID. This page includes earthquake forecast models and three possible scenarios for the next week. magnitudes between 3.2 and 4.1 (all USGS magnitudes). occurred within 16 mi of the epicenter of today’s magnitude 5.3 event. 9 mi NNW of Georgetown, ID. 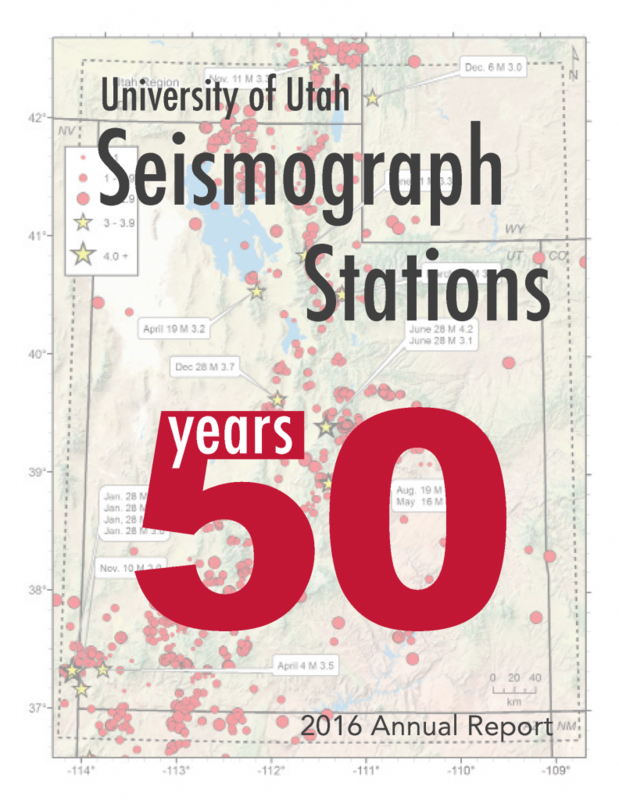 In April of 2016 the University of Utah Seismograph Stations (UUSS) celebrated the 50th anniversary of its creation as an organizational unit within the University of Utah. We celebrated this milestone with a party honoring the founding director, Dr. Ken Cook, and the unveiling of a new historical display just outside the Rio Tinto Earthquake Information Center. The ceremony was well attended by current and former UUSS employees, colleagues in the College of Mines and Earth Sciences, representatives of sister agencies in the Utah Earthquake Program, members of Dr. Cook’s family, and many other friends of UUSS. Here’s to another 50 years of reducing the risk from earthquakes in Utah through research, education, and public service. 2016 was also a year of transition for UUSS. Our administrative manager, Martha Knowlton, retired after 14 years of service. We will miss Martha’s attention to detail, professionalism, and strong work ethic. UUSS communications specialist Sheryl Peterson, who has worked in various capacities for UUSS since 1989, also left in the fall of 2016. Sheryl’s competence, cheerfulness, and organizational skills will serve her well as she pursues a new career as director of advancement operations at Southern Virginia University. We will also miss Katherine Whidden, a research scientist, student mentor, and the UUSS public information officer, who left in 2016 (ending a five-year stint with UUSS) to travel the country in an RV with her husband, John. In other news, Cindi Meier, who worked at UUSS during 1994-1999, agreed to return as our new full-time administrative officer. In 2016, we also welcomed Dr. Hao Zhang to UUSS as a post-doctoral research scientist focusing on the detection and location of sequences of very small earthquakes. We look forward to an exciting new year in 2017. I encourage you to visit our revamped web page at quake.utah.edu to stay up- to-date on our new initiatives and products as well as to nd out about the latest seismic activity in Utah. You can also follow UUSS on Twitter with the handle @UUSS_Quake_Info. (MDT). The epicenter of the shock was located 9.3 mi N of W.
a magnitude 4.4 event on June 15, 2017, 9.0 mi NNE of W.
earthquakes in the current sequence has now exceeded 1200. The University of Utah Seismograph Stations reports that a light earthquake of magnitude 4.5 occurred at 06:48 PM on June 15, 2017 (MDT). The epicenter of the shock was located in Yellowstone National Park, eight miles north-northeast of the town of West Yellowstone, Montana. The earthquake was reported felt in the towns of West Yellowstone and Gardiner, Montana, in Yellowstone National Park, and elsewhere in the surrounding region. Today’s earthquake is part of an energetic sequence of earthquakes in the same area that began on June 12. This sequence has included approximately thirty earthquakes of magnitude 2 and larger and four earthquakes of magnitude 3 and larger, including today’s magnitude 4.5 event. Today’s earthquake is the largest earthquake to occur in Yellowstone National Park since March 30, 2014, when a magnitude 4.8 event occurred 18 miles to the east, near Norris Geyser Basin. 4.6 on March 20, 1995, which occurred in the same area.